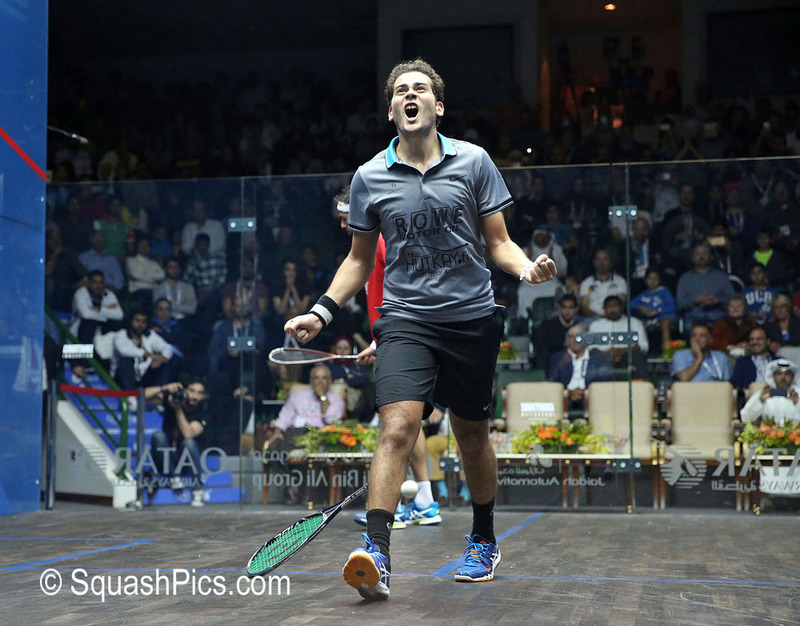 World Champion Karim Abdel Gawad’s stunning 2016/17 season continues to go from strength-to-strength after the he put in a superb performance to defeat World No.1 Mohamed ElShorbagy in the final of the 2016 Qatar Classic held at the Khalifa International Tennis and Squash Complex in Doha - lifting his first World Series title in the process. The 25-year-old from Egypt has been the man in form over the past few months and triumphed at the PSA Men’s World Championship just a fortnight ago in Cairo to lift the sport’s biggest prize - beating ElShorbagy in the semi-final, before moving on to overcome Ramy Ashour in the showpiece finale. ElShorbagy tried to halt his compatriot’s momentum in the third, but Gawad - playing with the skill and effortless brilliance that has become par for the course from the World No.3 this season - held firm to take it 12-10, 15-13, 11-7 to seal the title. 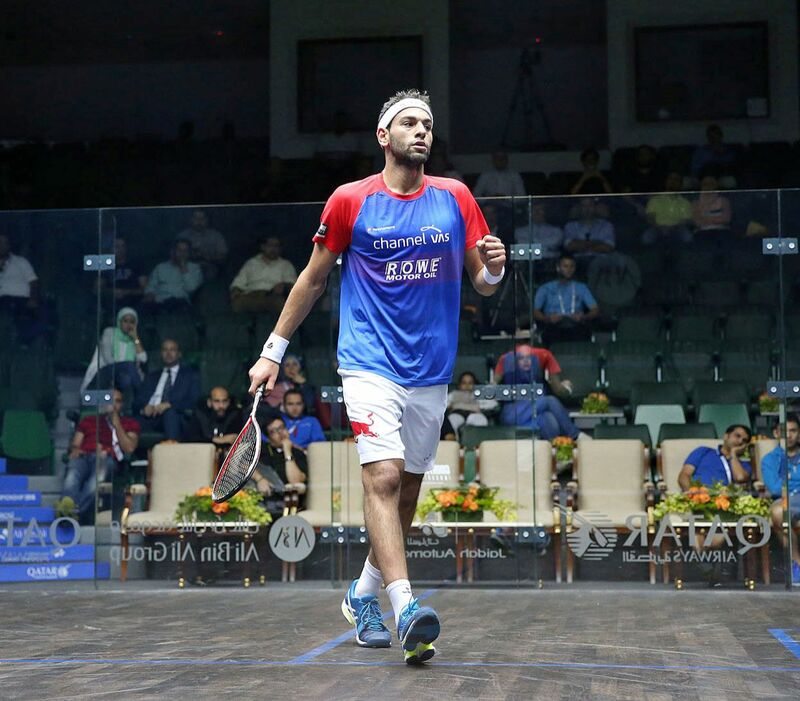 Gawad’s victory also ensures that he will overtake ElShorbagy at the summit of the 2016/17 PSA Road to Dubai Standings - where only the top eight players will qualify for a place at the season-ending Dubai PSA World Series Finals - after taking the maximum points on offer in Qatar. "For the first time, I was under pressure. When you are a World Champion, people expect you to win and expect that you have a big chance to win. That is a new element I had to integrate into my preparation. "Being World Champion and Qatar Champion sounds good, really good. I’m living the dream. But next season, I’m aware that I’ll have to make sure I’m very consistent if I want to stay in competition with the top boys." ElShorbagy was effusive in his praise of his opponent, saying: "Karim deserves to be the champion, he’s played so well in this first part of the season. It was a great match, and the best player on the day won. "I need to thank my team for the support they are giving me day in, day out. I couldn’t do it without them." 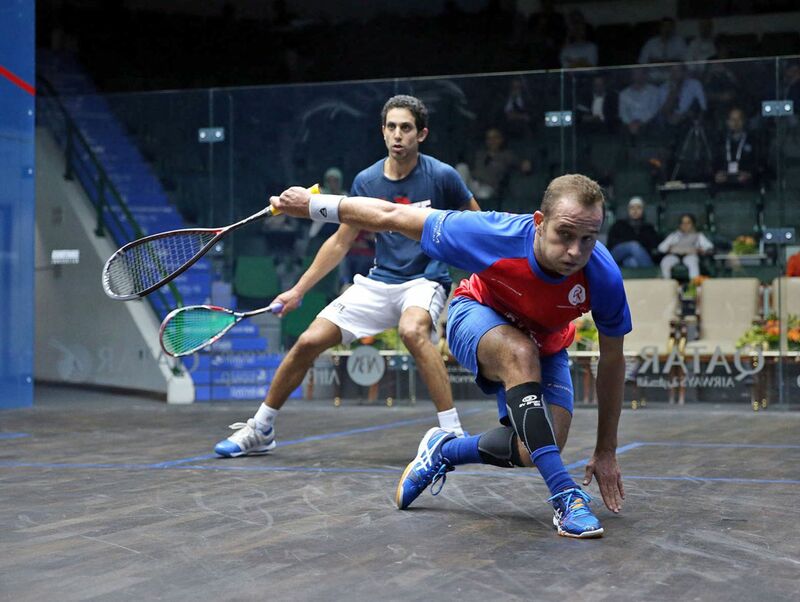 World No.1 Mohamed ElShorbagy will clash with World Champion Karim Abdel Gawad in the final of the 2016 Qatar Classic after Egypt defeated England on the fifth day of action at the World Series tournament held at the Khalifa International Tennis and Squash Complex in Doha. 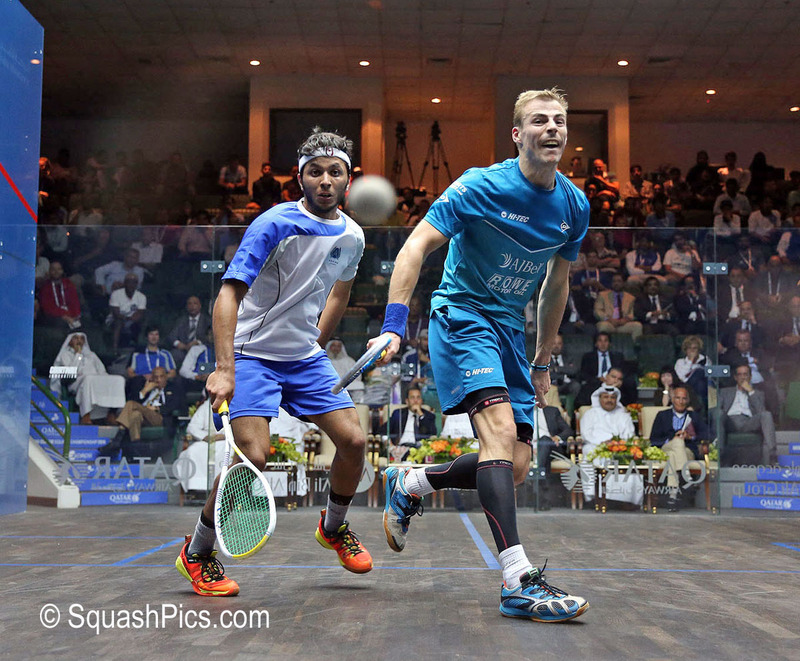 ElShorbagy went up against England No.1 Nick Matthew in the latest chapter of their epic rivalry, with their last match seeing ElShorbagy overturn a two-game deficit to win in last month’s U.S. Open final. Much like in Philadelphia, the Egyptian found himself on the receiving end of a Matthew masterclass in the opening two games as the three-time World Champion limited ElShorbagy’s ferocious hitting to great effect. 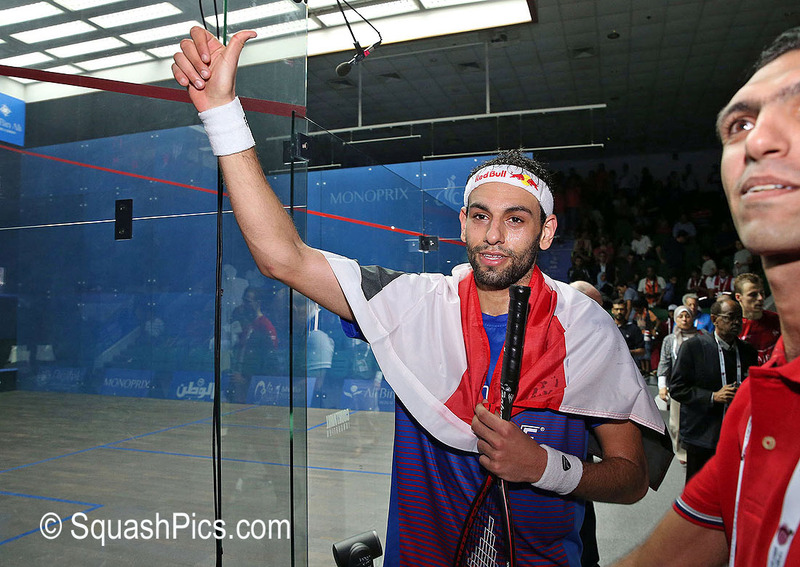 But ElShorbagy overturned a 9-7 deficit to win the third game, which sparked a storming comeback from the Egyptian, who outplayed Matthew in the fourth and ground out a tense win in the decider to claim an 8-11, 9-11, 11-9, 11-4, 11-9 victory to reach a second World Series Final in a row. 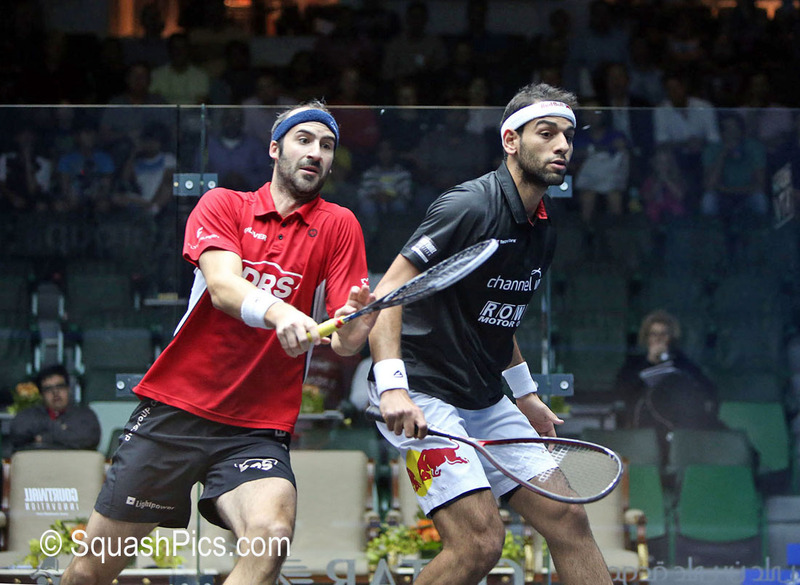 "I think we were both up and down in our level in this tournament, but this is the 20th time we’ve played each other in our career," said ElShorbagy. "For me tonight, I think that was my best performance of the whole season. The way I fought back and the way we played, I think we had a go at each other, but we played the game in the right spirit. "I think we played a great match, it was a great battle. Thanks to him for having a great match and I’m sure we’re going to have other great battles again in the future." Gawad, meanwhile, will also appear at a second World Series final of the season after defeating England No.3 Daryl Selby by a 3-1 margin. The World No.3 - who won the sport’s biggest prize, the PSA Men’s World Championship, a fortnight ago - also reached the final of the Hong Kong Open in August, and overcame a strong start from Selby in Doha to take the match in four. Gawad and ElShorbagy last met in the semi-final stage of the World Championship, with Gawad winning in five to seal a first ever win over his compatriot. “Everyone is under pressure, that’s just part of the sport,” said Gawad. “Everyone hides it their own way, but inside I feel so much pressure. It’s part of our game so I have to deal with it. The pair’s final encounter with have extra significance on the 2016/17 PSA Road to Dubai standings, with ElShorbagy situated in first place with 115 points, while Gawad sits just 10 points behind him in second. A win for either player would go a long way to boosting their qualification chances for the lucrative season-ending Dubai PSA World Series Finals - where only the top eight qualifiers will claim a coveted berth - adding yet more motivation ahead of tomorrow’s final. The pair have met 19 times on the PSA World Tour, with defending champion ElShorbagy winning 11 of them - including the 2013 Qatar Classic final where the 25-year-old Egyptian claimed his first ever World Series title. “Every player has a quality that is different from other players. Maybe my quality is that I'm a fighter, I just keep fighting and that's maybe the thing that kept me alive in this match and got me a win at the end. “Mohamed is the number one player in the world, he has that same quality that I think I have, where he can get the wins even when he's not at his best, and he’s proven that over and over again," said Matthew, who lost out to ElShorbagy in last month’s Delaware Investments U.S. Open final. “I think it would be fair to say that neither of us have played our very, very best this week, but here we are in the semis." “I started the season really, really well, so I want to finish it as well as I started it. That’s the biggest push." A tactically astute display from England’s Selby saw the 34-year-old claim a spot in his first World Series semi-final since January 2012 after beating Pilley in four games. "It’s my first [World Series] semis since the Tournament of Champions four years ago," said Selby. 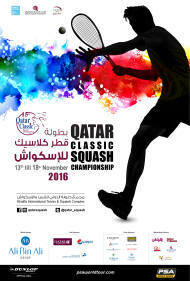 The third day of action at the 2016 Qatar Classic - the World Series tournament taking place at the Khalifa International Tennis and Squash Complex in Doha - saw German No.1 Simon Rösner put in an immaculate display to defeat former World No.1 James Willstrop. Rösner, the current World No.13, was deadly from the outset and executed his game plan to perfection, with a powerful and accurate performance sending Willstrop into all four corners of the court, drawing the normally accurate Yorkshireman out of his comfort zone and into a number of errors to record a superb 11-7, 11-7, 11-8 victory. 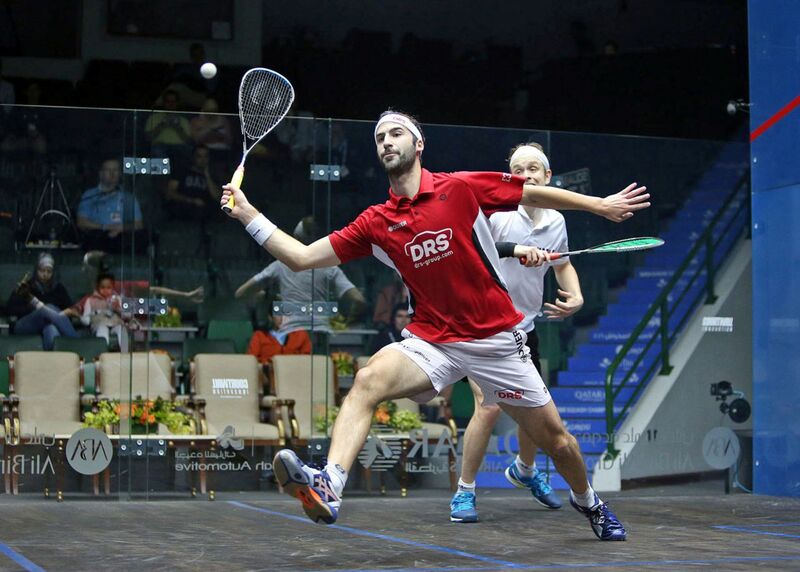 "I think I played my best squash, my best squash of the season, at least," said Rösner. "I kept him behind me most of the time and I was able to attack quite well at the front. I played attacking squash and I think that I can't play much better than that. "It’s so tough to beat this guy, I think he's pretty much back to normal and playing the way he used to before he was injured. To beat him in this form is quite special for me, so I'm really glad." Rösner will take on defending champion Mohamed ElShorbagy for a place in the semi-finals after the World No.1 overcame a strong challenge from Hong Kong’s Leo Au. A focused start from the man from Hong Kong saw him start the better of the two players, but ElShorbagy ramped up the pace to force Au into a number of errors towards the latter stages to take the lead. 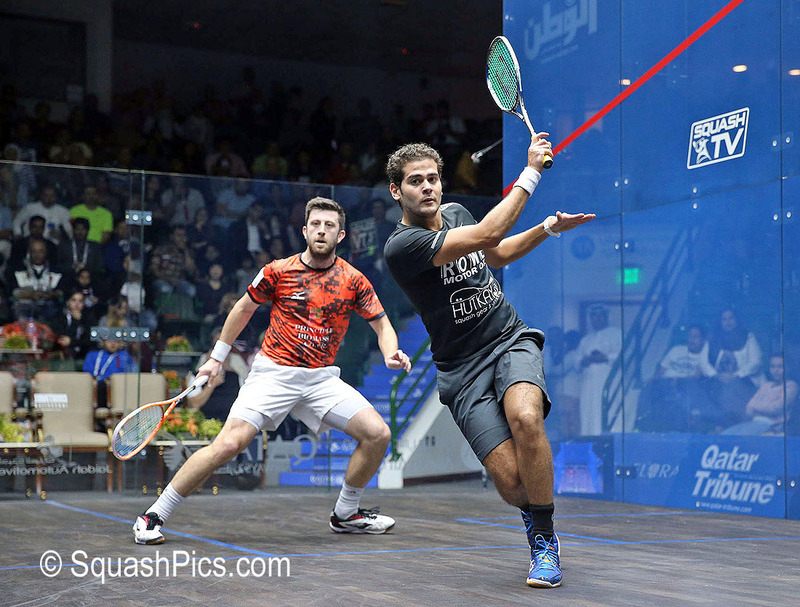 Au fought back in the second to draw level, but the Egyptian soon rediscovered his rhythm to pull through with a 12-10, 11-13, 11-8, 11-8 triumph. 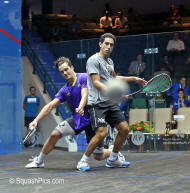 “I thought I was up and down again like the first round and I lost focus at times," said ElShorbagy. "Mentally, I felt a bit tired in the first round, but today I felt fresh. When you're playing short, sharp rallies, you have to be mentally fresh to keep it up. If you're not, you're going to struggle big time in these kinds of conditions. "Yesterday, I took the full day off, I didn't even touch my squash racket for even a minute, and I never normally do that during tournaments, but I had to. After a long two years, I had to take one day off and I felt that I deserved one." 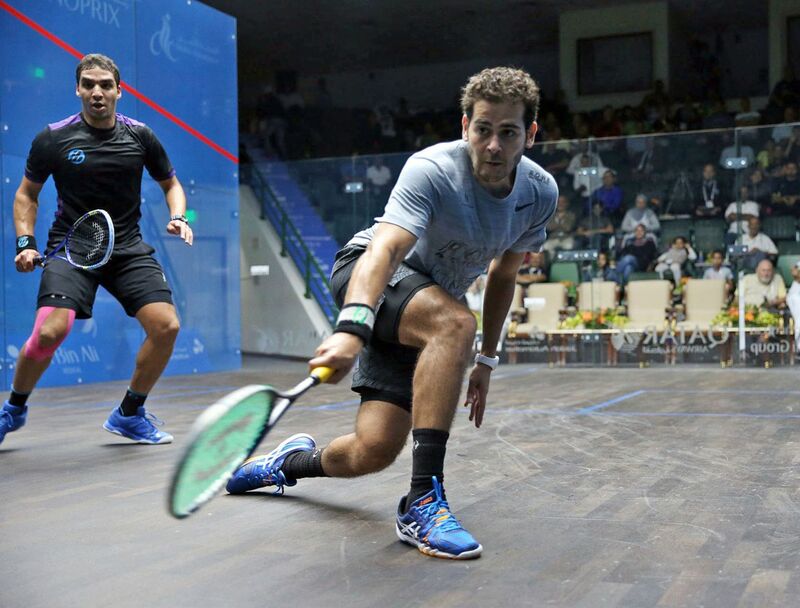 World Champion Karim Abdel Gawad continued his title charge, but was forced all the way to five games after a dogged challenge from fellow Egyptian Zahed Mohamed to set up a quarter-final fixture with World No.7 Marwan ElShorbagy, with the 23-year-old defeating Australia’s Ryan Cuskelly. Gawad twice saw a one-game lead wiped out by Mohamed, who dug in and hit a number of sumptuous winners against his in-form compatriot. But a fast start to the fifth game from Gawad saw the 25-year-old finally break Mohamed’s resistance, and he recorded a 13-11, 9-11, 11-3, 9-11, 11-5 victory to reach the last eight. 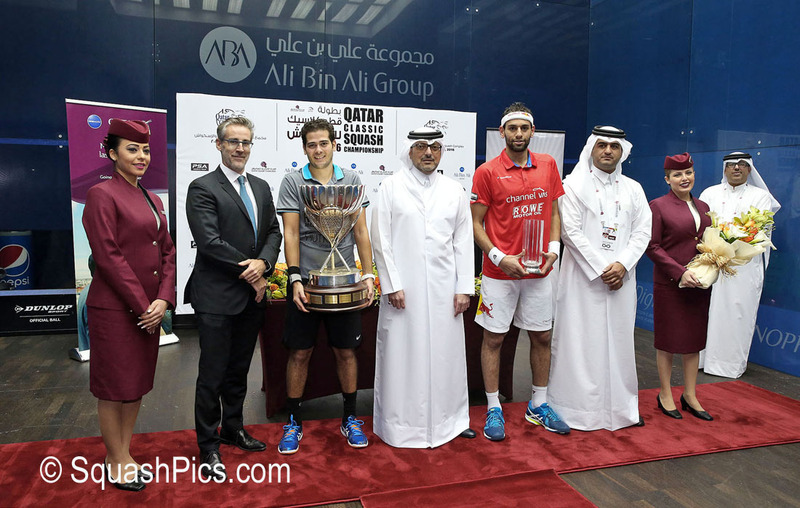 "Since my first tournament here in Qatar, I played really well and I always play well here," said Gawad. Frenchman Gregoire Marche has reached his first ever World Series quarter-final after coming through an intense five-game contest with World No.9 Tarek Momen. It was one-way traffic in the beginning of the encounter, with Momen looking sharp as he went a game ahead for the loss of four points. Marche moved up through the gears to take the next two games, but a combination of strong retrieving from Momen and some errors from the racket of Marche saw the Egyptian level, before Marche took the fifth to close out a hard-fought triumph. "It’s my first ever World Series quarter final, and I feel this is not the end," said Marche. Three-time World Champion Nick Matthew will face Marche for a place in the semi-finals after defeating tenacious Scotsman Alan Clyne, while Australian No.1 Cameron Pilley and World No.19 Daryl Selby will contest the other quarter-final fixture courtesy of respective wins over Mexico’s Cesar Salazar and qualifier Adrian Waller. 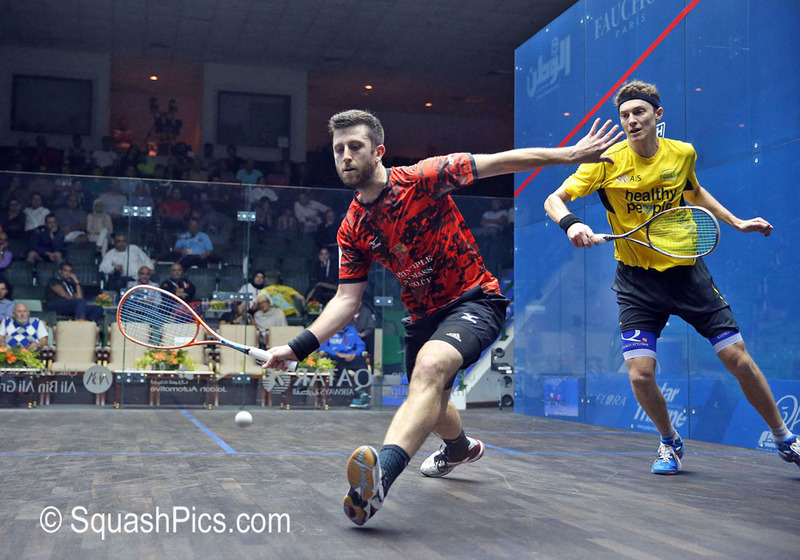 England’s Daryl Selby claimed one of his biggest wins in recent years after he came through a five-game battle with World No.4 Omar Mosaad on the second day of the 2016 Qatar Classic, World Series tournament held at the Khalifa International Tennis and Squash Complex in Doha. The World No.19 relinquished a one-game lead to go 2-1 down, but produced a spirited fightback to claim a huge 11-9, 5-11, 2-11, 11-9, 11-2 victory for the 34-year-old - his first win over Mosaad at the sixth attempt. "It was tough as it always is, and it hasn’t really sunk in yet, but I’m delighted obviously to beat him for the first time," said Selby. "It was a similar match to the ones we’ve played in the past, they always seem to be five-gamers and they’re always fairly physical. I expect that really because he’s such a big guy. He’s tough to play because he hits the ball so hard and so cleanly. "Maybe I kept my head a little bit better in the fifth game and he looked a little bit despondent. He’s lacking a little bit of confidence at the moment, whereas I’ve been having some decent results." 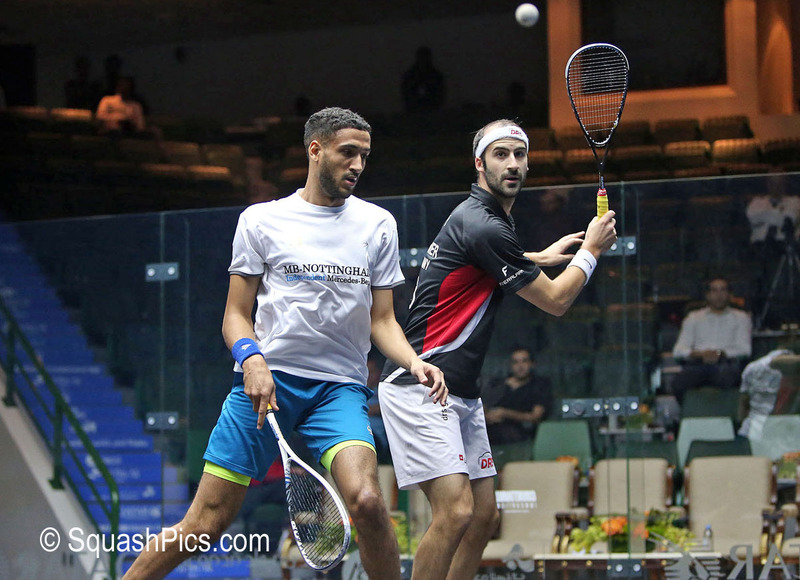 World Champion Karim Abdel Gawad got his tournament off to a winning start as he led compatriots Marwan ElShorbagy (left) and Zahed Mohamed through to the second round, where there will be a five-strong Egyptian contingent after World No.1 Mohamed, the older brother of Marwan, and World No.9 Tarek Momen claimed wins on the opening day of action. 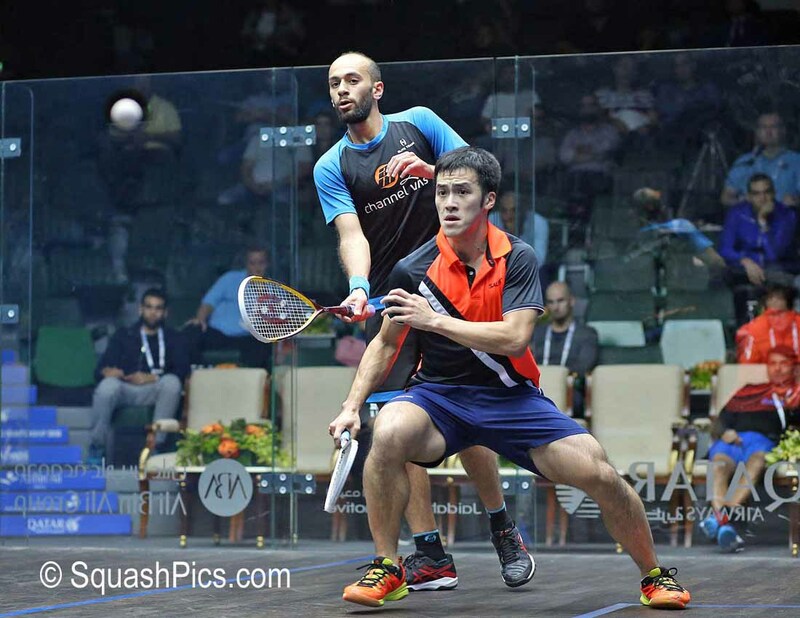 Gawad, competing less than two weeks after he defeated compatriot Ramy Ashour in the PSA Men’s World Championship final in Cairo, went a game behind courtesy of some consistent play from Reda. But the 25-year-old found his range and showcased his sublime attacking talents to full effect as he won the next three games in comfortable fashion, taking it 9-11, 11-6, 11-4, 11-3 to ensure that he will take on Mohamed - who beat England’s Tom Richards - for a place in the quarter-finals. "I was very, very tired after the World Championship,” said Gawad. World No.7 Marwan booked his place in round two after rising to a routine 3-0 win over Hong Kong’s World No.41 Tsz Fung Yip. Yip, who claimed a notable win over World No.8 Miguel Angel Rodriguez in August’s Hong Kong Open, started brightly and went 3-0 ahead in the opening game before ElShorbagy took control, coming through 11-7, 11-8, 11-6 in 27 minutes – and he will face Australian No.2 Ryan Cuskelly in the next round. “I was very happy, it was my first time playing Yip, he’s had a few good wins and I had to watch a few of his matches to study him,” said ElShorbagy. “I had to be careful from the beginning and not give him any chances as he would have taken them. I’m very happy to win in less than half an hour. 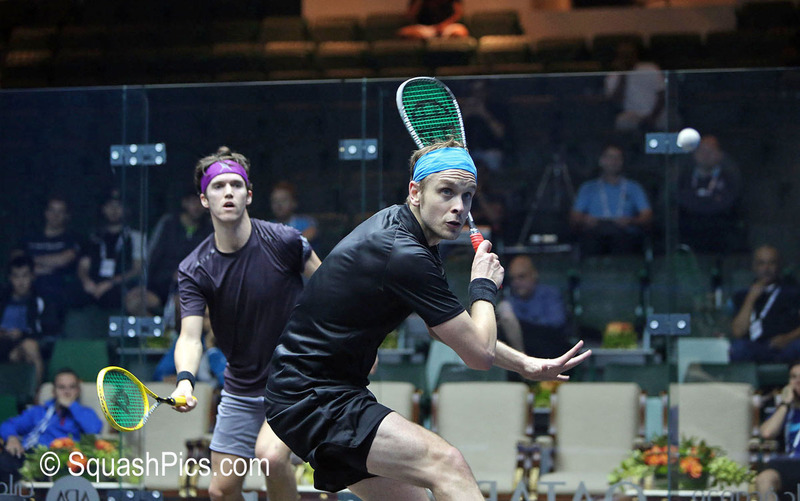 There are no rest days for us in the bottom half, so it’s perfect for me against Cuskelly." Cuskelly made history at this tournament last year after he became the first player since 2001 to come through qualification and progress to the last four of a World Series tournament - and he required five games to see off World No.17 Max Lee. Lee was irresistible early on as he swept to a one-game lead for the loss of three points, but a tenacious Cuskelly refused to bow down to the pressure as he battled back to go 2-1 ahead. The 29-year-old was unable to convert a match ball though, and Lee forced a decider, only to succumb to cramp as Cuskelly closed out a 3-11, 11-9, 11-6, 11-13, 11-9 victory. "I probably didn’t play the best but I tried to stay solid and he gave me a few cheap ones in the end before he started cramping, so I was a bit lucky," Cuskelly admitted. Cuskelly will be joined in the next round by fellow Australian Cameron Pilley (left), who defeated Nafiizwan Adnan in straight games, and Pilley will face Cesar Salazar in round two after the Mexican beat Omar Abdel Meguid. England’s Adrian Waller overcame World No.34 Nicolas Mueller in the day’s other fixture and he will take on Selby for a place in the quarter-final stage. 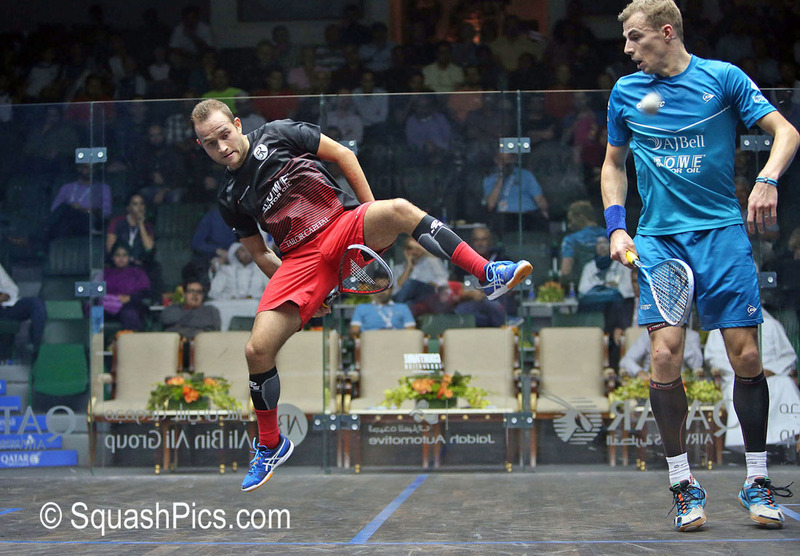 Three-time World Champion Nick Matthew came within two points of falling to a shock defeat to tournament wildcard Abdulla Mohd Al Tamimi during a stunning opening day of action at the 2016 Qatar Classic - the World Series tournament held at the Khalifa International Tennis and Squash Complex in Doha. 36-year-old Matthew won this tournament in 2009, but relinquished a two-game lead against Qatari No.1 Al Tamimi, who - buoyed by vocal home support - went 8-4 up in the decider to threaten a huge upset. But Matthew drew on his 18 years of professional experience to wrestle back momentum of the match, taking seven of the next eight points on offer to seal an 11-9, 11-8, 9-11, 10-12, 11-9 victory. “Physically I felt great, but he is such a clever player and anything I played short he was able to counterattack me beautifully,” said Matthew. "I’m not sure how I won that to be honest. I think today he deserved to win. When we had that ridiculous rally where we both ran like headless chickens, and he ended up playing that incredible winner, I thought ok, maybe this is not your day, maybe it’s his day, you’ve got to take it on the chin. “The only thing I tried to do was to hold my head high and hope that maybe at the end he would get a bit nervous." Defending champion Mohamed ElShorbagy was also in action on day one as he too was forced all the way to five games by his first round opponent, Peruvian Diego Elias. The World No.1, who defeated Frenchman Gregory Gaultier in last year’s final, went ahead twice but was forced all the way to a fifth by two-time World Junior Champion Elias, who hit some superb winners. The hard-hitting Egyptian looked to be struggling with his movement a little bit towards the end of the fourth game, but he recovered to take the fifth, closing out an 11-4, 8-11, 11-8, 6-11, 11-5 triumph, ensuring he will face Hong Kong’s Leo Au in the next round. 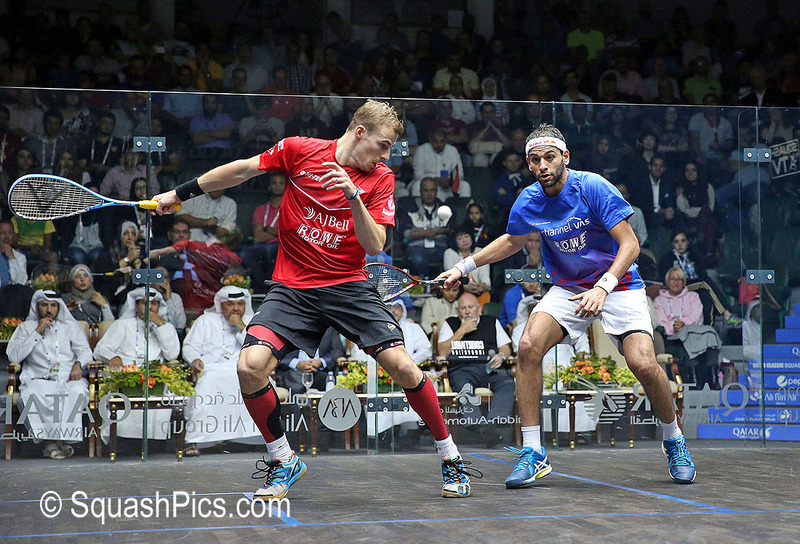 “I have great memories in Qatar, that’s where I won my first World Series title, so it’s a very important place for me,” ElShorbagy said. “It’s very hard to back up tournaments, we just finished the Worlds in Cairo, and win or lose, it’s very hard to back them up. It’s just different emotions, but it’s very hard for the body. “I’m just very happy to get through and live another day in this event. I think it’s just my experience that paid off at the end of the fifth, I got a good start there too." He will be joined in round two by compatriot Tarek Momen who played out the match of the day against New Zealand’s Paul Coll, with their high-octane 101-minute encounter featuring a veritable feast of stunning retrievals. With the scores poised at two games apiece, both players fought against cramp as the match crept towards its conclusion, with Coll overturning multiple match balls to stay in the encounter. At 16-15 down though, a lunge towards the back of the court left Coll doubling over in pain, enabling Momen to force the win over the line to close out a nail-biting 7-11, 11-8, 8-11, 12-10, 17-15 triumph. 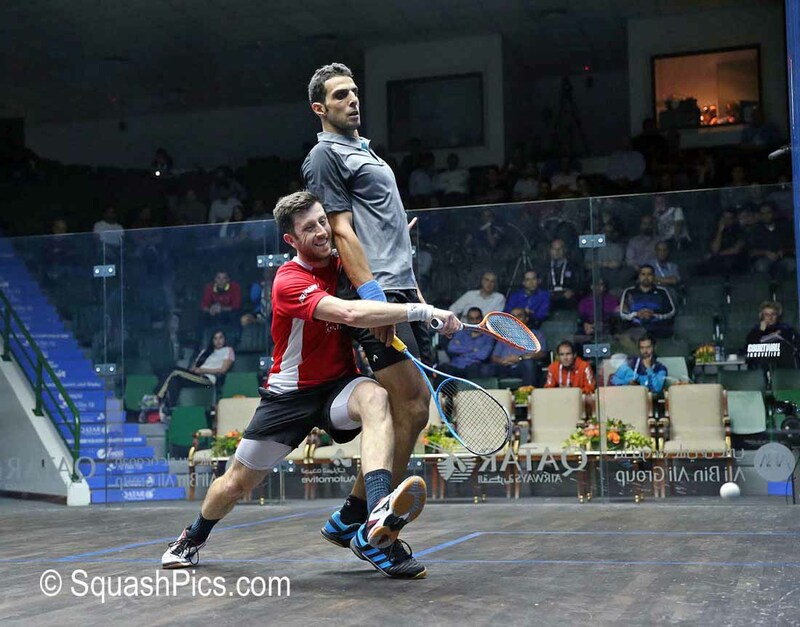 “In that last lunge I did, both my hamstring and my quads cramped together," said Momen. "I was wondering when he would cramp, up until he cramped I thought he wasn’t human to be honest, it was unbelievable. I had no idea how I pulled that off to be honest. My motto today was that I wasn’t going to give up until the last point. I knew I had good momentum after the World Championship, I didn’t want to break that momentum." Former World No.1 James Willstrop followed fellow Yorkshireman Matthew through to the second round after the 33-year-old recovered from a game down to defeat World No.20 Chris Simpson in an all-English affair. The former World No.1 fell victim to a strong start from Simpson in game one, but put in a masterclass in the next three games, failing to drop a single point in the fourth to close out a 7-11, 11-2, 11-4, 11-0 triumph. “He was playing well, but I didn’t really panic because I felt that my quality was there,” said Willstrop. “You’ve just got to ignore the scoreboard a bit really, otherwise you get carried away with being behind and that becomes a negative thing. I just kept telling myself that it didn’t really matter and what did matter was how well I was playing squash. I held it together and it worked for me a little bit later in the match." ‘The Marksman’ will take on German No.1 Simon Rösner for a place in the last eight after Rösner saw off World No.41 Declan James, while Scotland’s Alan Clyne came up with the day’s biggest upset after he ended a five-match losing streak to Indian No.1 Saurav Ghosal, setting up a second round clash with Matthew. Frenchman Gregoire Marche and Hong Kong’s Leo Au were the other victors on day one and they have lined up fixtures with Momen and ElShorbagy in the next round. Fung Yip at the Khalifa International Tennis and Squash Complex in Doha. with World No.7 Marwan ElShorbagy. "I think today was more a mental thing than a tactical choice," said Yip. "I was the underdog and that released a lot of pressure. I only tried to compete and perform. I tried to keep the ball as tight as possible and not to give anything to him in the middle. "I’m happy, today was my day." No.1 Pilley after sweeping to a win in straight games against Kuwait’s Abdullah Al Muzayen. "I am really happy to beat Abdullah today," Adnan admitted. holding and cross courting, that’s his strength, but today I did manage it." 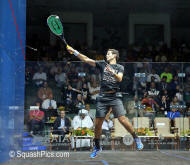 draw, while Clyne will lock horns with India’s Saurav Ghosal. Adrian Waller were the other victors on the final day of qualification. taking place on Friday November 18. Entry to the tournament is free of charge. 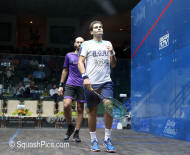 Egyptian World No.6 Ali Farag will take no part in the upcoming Qatar Classic after suffering a hip injury in training. 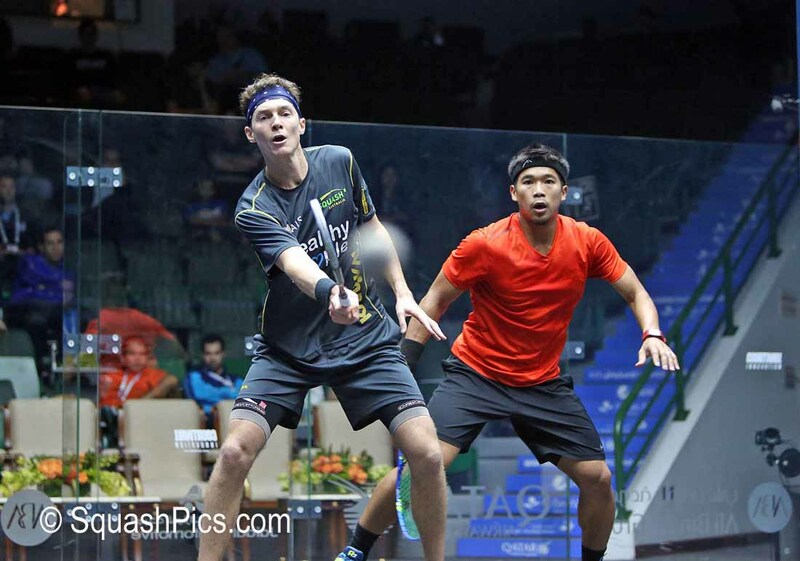 The 24-year-old Harvard graduate - who reached the quarter-final stage of the PSA Men’s World Championship last week in Cairo - will be replaced as the tournament’s number eight seed by Australian No.1 Cameron Pilley, with Pilley going up against a qualifier in the first round. Meanwhile, Peruvian two-time World Junior Champion Diego Elias moves into the main draw and he will lock horns with World No.1 Mohamed ElShorbagy. World Championship runner-up Ramy Ashour has pulled out of the upcoming Qatar Classic after failing to recover from the hamstring injury he picked up during last week’s PSA Men’s World Championship final. The maverick Egyptian has suffered a barrage of hamstring injuries over the past two years, however his body looked to be coping as he made it all the way to the final in Cairo. 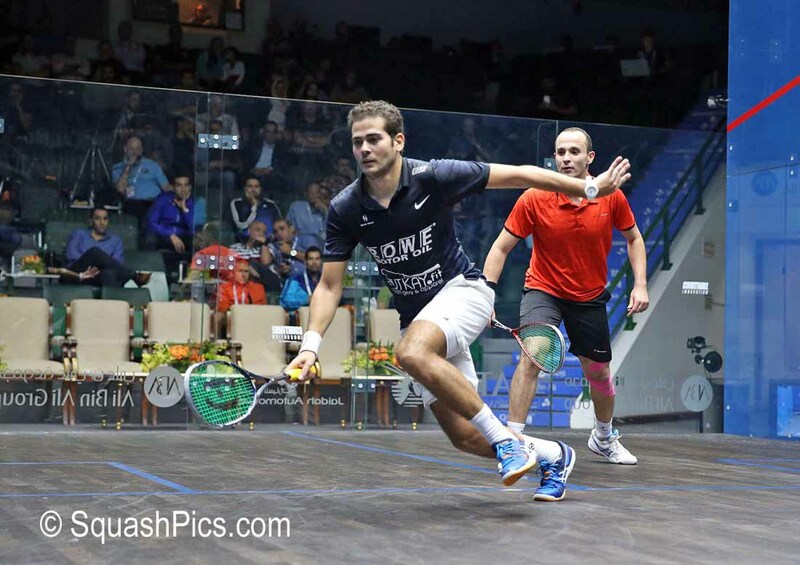 But he was forced to shake hands in the fourth game of his clash with compatriot Karim Abdel Gawad, bringing a premature end to the match and preventing ‘The Artist’ from appearing in Qatar, the scene of two of his three World Championship triumphs. 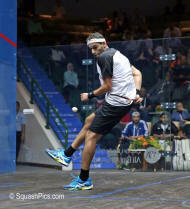 The injury will also dent Ashour's hopes of being one of the eight qualifiers for the season-ending Dubai PSA World Series Finals as he will be unable to accrue vital points on the PSA Road to Dubai Standings - where he currently sits in third place - with the Qatar Classic acting as the third stage on the PSA Road to Dubai. As a result of the injury, German No.1 Simon Rösner takes Ashour's place as the number eight seed and will meet a qualifier in the opening round, while Switzerland’s Nicolas Mueller moves into the main draw and will also face a qualifier. 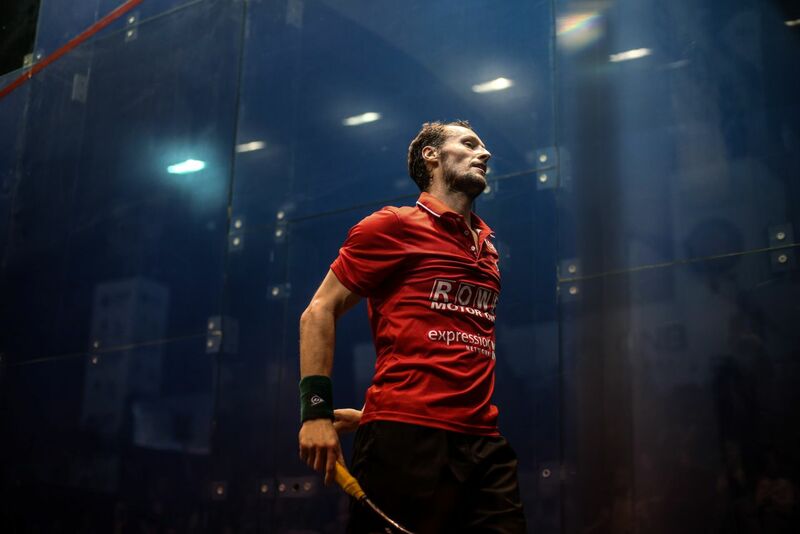 World No.2 Gregory Gaultier has withdrawn from the 2016 Qatar Classic after he was unable to recover from the ankle injury he sustained during last week’s PSA Men’s World Championship. 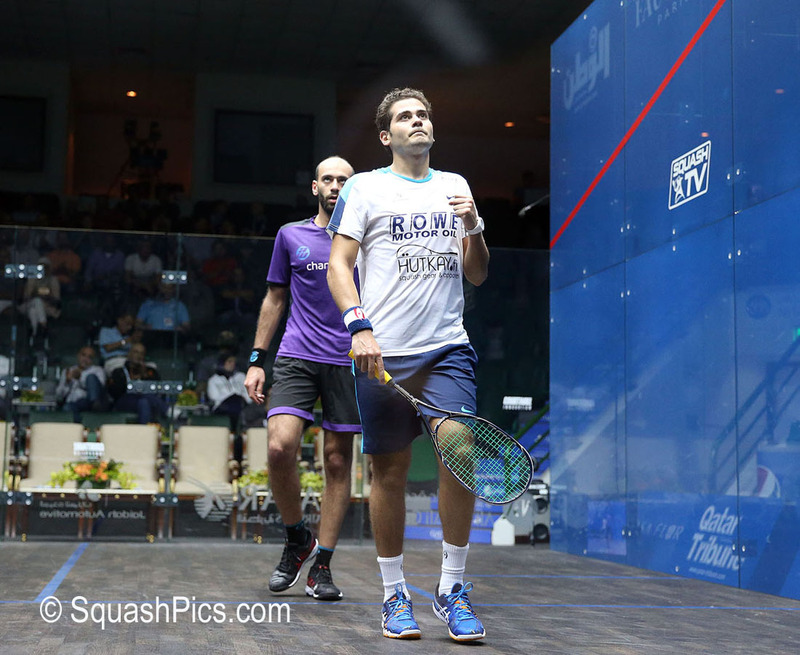 The Frenchman, a 2011 Qatar Classic winner and a runner-up last year in Doha, picked up the injury during his quarter-final clash with Egypt’s Tarek Momen in Cairo last week and was forced to withdraw from his semi-final fixture with World No.10 Ramy Ashour as a result. His ankle problem is the latest in an injury-hit year for the 33-year-old, who has already spent two months on the sidelines after damaging ligaments on the same ankle during January’s J.P. Morgan Tournament of Champions. World No.4 Omar Mosaad replaces Gaultier as the number two seed and will play England’s Daryl Selby in round one, while 2009 winner Nick Matthew moves up to the number four seeded position and will play tournament wildcard Abdulla Mohd Al Tamimi. Elsewhere, Momen moves up to become the new number eight seed and will face a qualifier, with Hong Kong’s Leo Au moving into the main draw where he too will lock horns with a qualifier in the opening round. 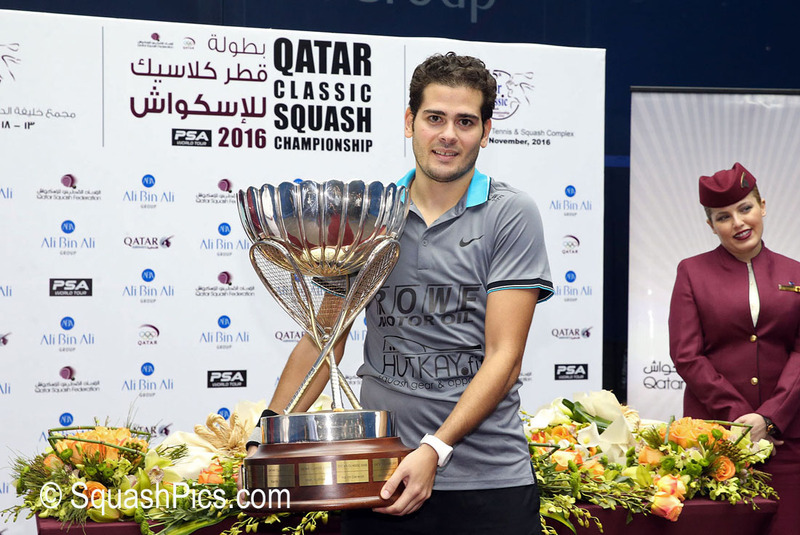 Recently-crowned World Champion Karim Abdel Gawad will look to continue his superb form in the upcoming Qatar Classic after the draw for the World Series tournament - which will take place between Sunday November 13 - Friday November 18 in Doha - was released today (Monday November 7). The world’s greatest players will battle it out for crucial points on the PSA Road to Dubai Standings - which is topped by World No.1 Mohamed ElShorbagy - with a place at the lucrative season-ending Dubai PSA World Series Finals up for grabs for the top eight. 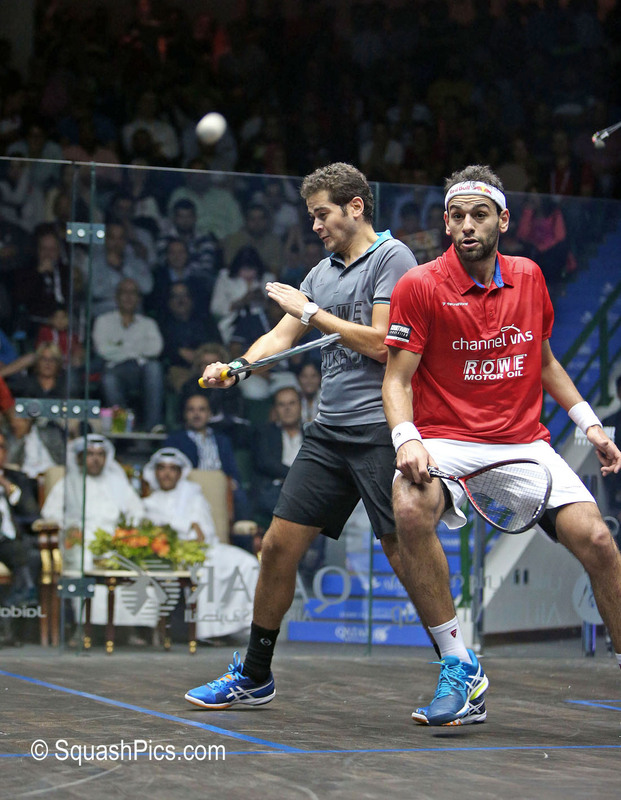 Gawad, the 25-year-old from Giza, Egypt, lifted the sport’s most prestigious title at the Wadi Degla PSA Men’s World Championship last week in Cairo, beating three-time winner Ramy Ashour to add to the Al Ahram Squash Open NEWGIZA title he claimed in front of the iconic Great Pyramid of Giza earlier this season. The World No.3 will meet a qualifier in round one, and is seeded to contest a mouthwatering semi-final with 2015 World Champion Gregory Gaultier, who will hope to be fully recovered from the ankle injury he sustained during the World Championship. Defening champion ElShorbagy is also in action as he looks to bounce back from a semi-final defeat to Gawad in Cairo. 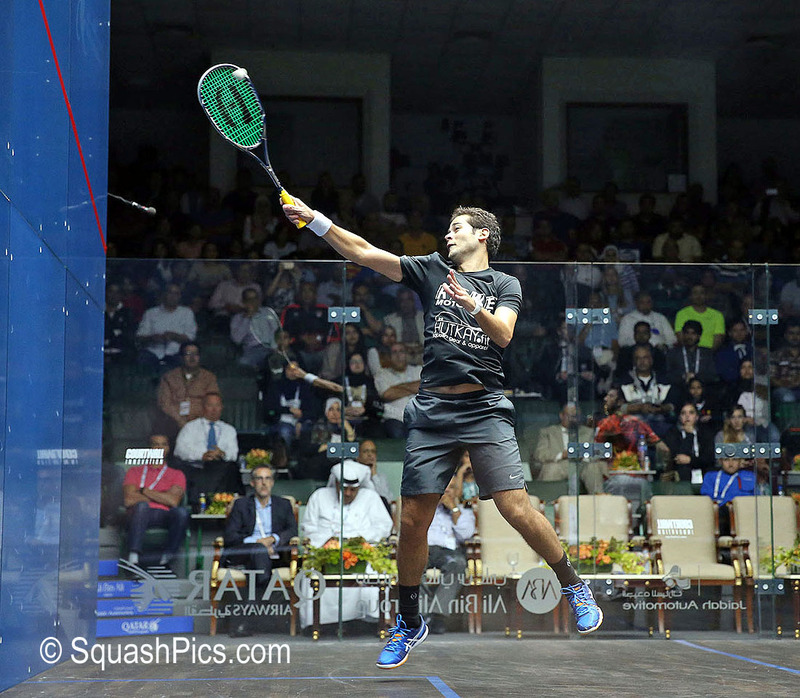 The hard-hitting Egyptian’s title-winning exploits at the Delaware Investments U.S. Open catapulted him to the top of the PSA Road to Dubai standings ahead of Gawad and he will aim to strengthen his grasp on top spot with a third successive Qatar Classic crown. ElShorbagy opens up against Australian No.1 Cameron Pilley - the player who ended his charge during the 2016 Dubai PSA World Series Finals - and could meet Ashour in an explosive quarter-final clash, which would act as the latest chapter in their long-running rivalry. 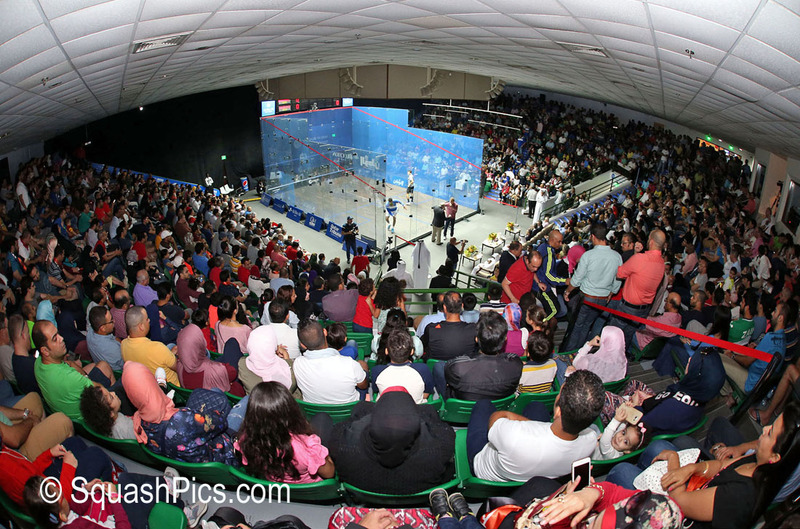 2009 victor Nick Matthew, 2015 World Championship runner-up Omar Mosaad and World No.6 Ali Farag are just some of the other big names included in a world-class draw, with Mosaad taking on the tournament wildcard, Abdulla Mohd Al Tamimi, in round one. The qualifying stages of the 2016 Qatar Classic will take place on November 11-12, while the main draw begins a day later, with the final taking place on Friday November 18 - entry to the tournament is free of charge. 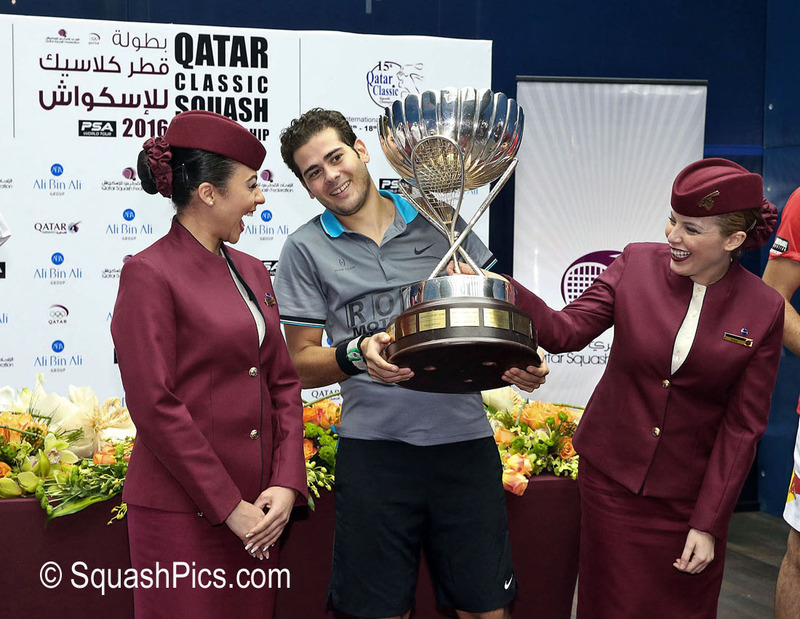 The world’s greatest players will once again descend on the Khalifa International Tennis and Squash Complex in Doha for the 2016 Qatar Classic – the third stage on the 2016/17 Men’s PSA Road to Dubai – when the prestigious World Series tournament begins on Sunday November 13. 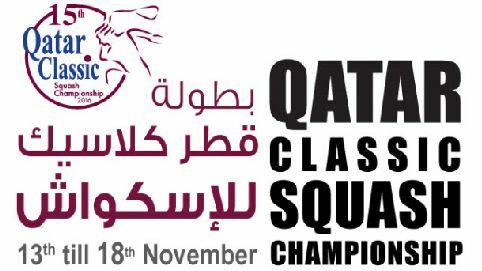 In addition to the lucrative prize purse of $150,000 on offer, the Qatar Classic offers the opportunity for players to accrue crucial points on the PSA Road to Dubai Standings, where only the top eight players will qualify for a place at the season-ending Dubai PSA World Series Finals. Defending champion Mohamed ElShorbagy tops an outstanding field as he returns to the scene of his two World Championship final defeats in 2012 and 2014, and the hard-hitting World No.1 is in fine form after triumphing at the Delaware Investments U.S. Open – the second stage on the PSA Road to Dubai – just last week. 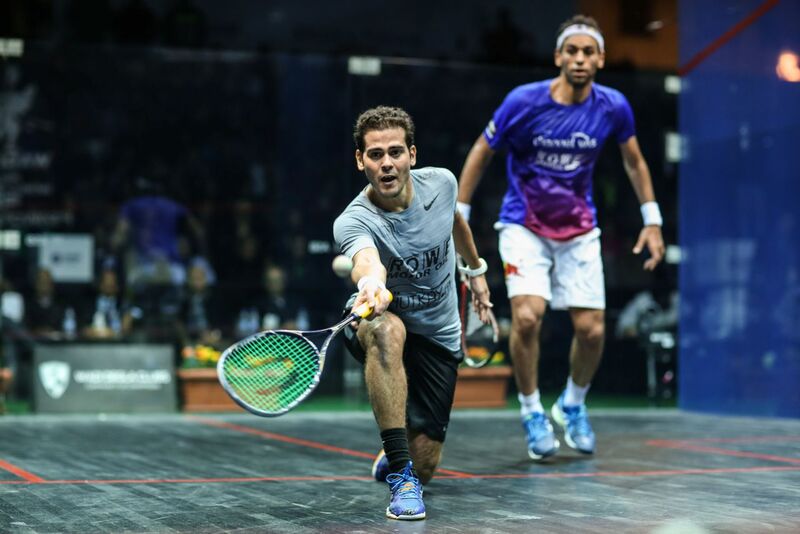 The man who ended ElShorbagy’s World Championship dream on those two occasions, fellow Egyptian Ramy Ashour, is also involved, with the former World No.1 looking to put his injury problems behind him as he eyes up a first Qatar Classic crown since 2007. A wealth of other world-class talent will also feature, with the likes of current World Champion Gregory Gaultier, World Championship runner-up Omar Mosaad, World No.4 Karim Abdel Gawad and three-time World Champion Nick Matthew all vying for honours in Doha. Qatari No.1 Abdulla Mohd Al Tamimi has been named as the tournament wildcard and will find out who stands between him and a place in the second round when the main draw gets released on Monday November 7.